Georgians are a religious people and Sunday is a day for church. The orthodox churches are simple but filled with icons. The mass seemed very unorganised to western eyes. The priest and other celebrants performed the blessing of the bread and wine in an inner sanctum and then brought them out to the congregation. There was no sitting in rows waiting though. People came and went, met their friends, lit candles and kissed icons as they wished. Men were dressed in their everyday clothes. The women add a colourful headscarf or wrap a shawl around jeans or shorter skirts. The atmosphere was of great intensity and devotion. The candles and incense filled the dark space. The press of people to receive the blessing was more like the scene at a celebrity press event. Behind it all, the plain song rose and fell. 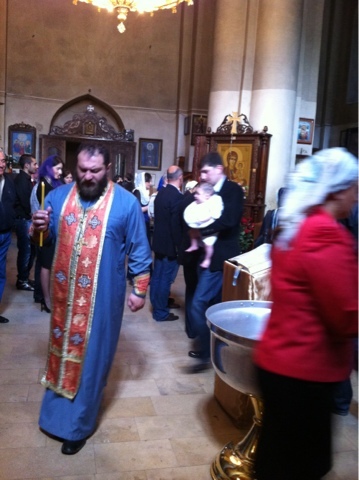 Later in the day at another Monastery I watched a baptism and a wedding going on at the same time. Even the people who were involved in the ceremony were not obviously listening to the priest as he read through the service.